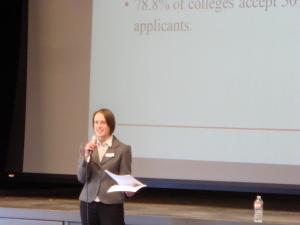 Are you looking for an experienced college consultant to do a presentation for your group? All presentations include time for Q & A. Contact us today to schedule an interactive and informative presentation for your group! Sara gave an incredible presentation to our entire junior class and their parents concerning the entire “college process”. Her presentation was concise, well organized, timely, and easy for parents to understand. She was open to feedback and prior to the evening sent me a copy of her presentation so that I could review it and ensure that she addressed issues in a manner that was custom fit for our population. We now have several families working with Sara for extra support and she has been excellent at communicating with us as counselors to ensure we are all on the same page. I highly recommend her as a presenter as well as a college consultant.